The Moral Compass | Rollespræll! Relic created by the dead god Loke. 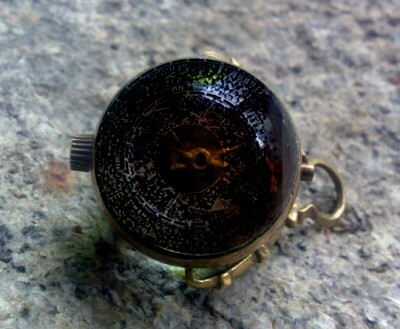 The Moral Compass is shaped like a sperical pocket watch with a miniature town inside. While possessing this relic, your INT, WIS and CHA is increased by 5, a score which can exceed the normal limit of 25. In addition, you no longer have any alignment, but you can adjust the compass to display any alignment you want. You are also impervious to mind affecting spells and spell-like powers. Finally, you can ask the compass whether or not you should undetake specific actions. Roll d100. On 1-50, the compass answers yes. On 51-100 the answer is no. If you go through with an approved action, all your hit/AC/dmg/abilities/etc. is increased by 50%. If you go against the advice of the compass, you are inflicted a similar penalty. Examples: Should I try to open that lock? Should I try to fight that dragon? Trying to circumvent the advice of the compass by asking questions such as “Should I try to fight the dragon today?” and then ask “Should I try to fight the dragon tomorrow?” if the first answer was no, WILL have dire consequences for the user.